Accu-Measure Digital Skinfold Calipers offer a fast way to assess body composition. Available in Gold and Pro versions. 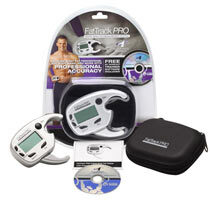 Caliper stores 3 measurements, calculates and displays body-fat percentage. Comes with battery CR2032. Dimensions: 2.8" x 0.4" x 2.8"
Caliper stores 3 measurements, calculates and displays body-fat percentage. Deluxe model has 50-person memory and carry case. Comes with battery CR2032.